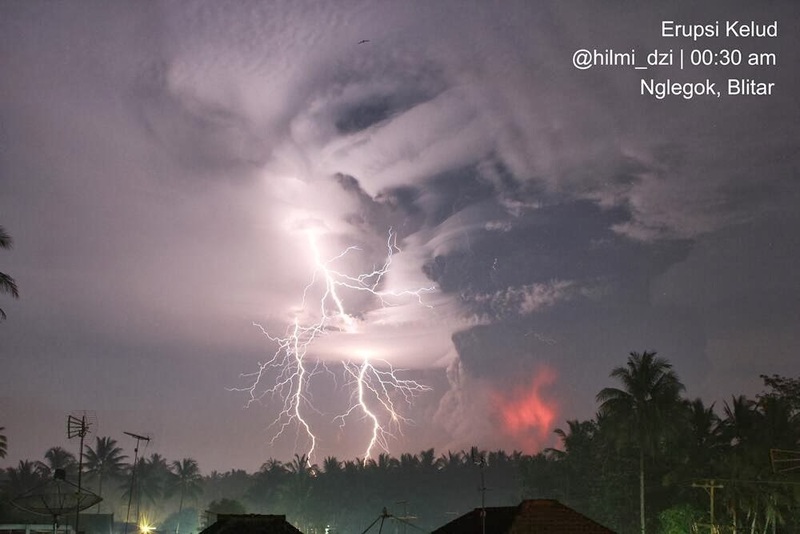 A large explosive eruption occurred in the evening of 13 February 2014, starting at 21:15 local time, after just two hours of precursor shallow earthquakes. The explosion ejected an estimated 80-160 million m3 of tephra and ranks as a VEI 4 (or subplinian) event. The eruption plume rose to up to 27 km altitude and produced an umbrella cloud at 19 km altitude that drifted over the Indian Ocean. Heavy ash fall occurred around the volcano and in large areas of Java. Fortunately, only few fatalities were caused by the eruption. Late on February 13, 2014, Kelut (also called Kelud) exploded with a powerful eruption. Satellites first detected the eruption plume at 11:09 p.m. local time (16:09 UTC). At 12:30 a.m. (17:30 UTC), the Visible Infrared Imaging Radiometer Suite (VIIRS) on the Suomi NPP satellite acquired the top image as the mushroom-shaped ash plume reached above a lighter-colored cloud deck. Forty minutes later, at 1:10 a.m. (18:10 UTC), the Cloud-Aerosol Lidar and Infrared Pathfinder Satellite Observation (CALIPSO) satellite flew over the plume with CALIOP, its lidar instrument. Acting like a laser range finder, CALIOP uses a laser to create a profile of clouds and particles in the atmosphere. 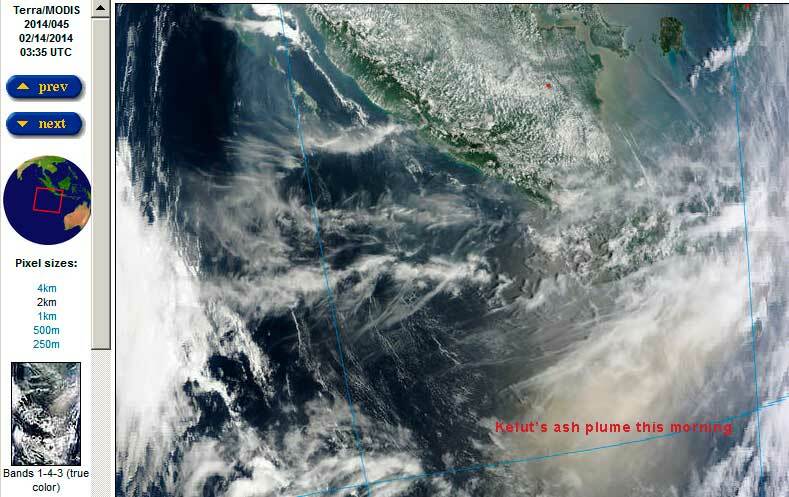 The instrument recorded the ash cloud at nearly 20 kilometers (12 miles) altitude, with sections of the plume reaching to nearly 30 kilometers (19 miles). The website of the International Charter Space and Major Disasters has great annotated satellite images showing the volcano before and after the eruption as well as the extensive ash and lahar deposits. At the place of the 2007 lava dome, a crater of about 400 m diameter was formed by the explosion. The SO2 aerosol plume from the eruption is drifting over the Indian Ocean. Despite the impressive explosion, in terms of quantity of SO2 ejected into the atmosphere, the eruption was a very modest event and is not going to affect earth's climate. As the eruption column was propelled upwards, driven by positive buoyancy due to the enormous heat content, its momentum made it shoot over its buoyancy-equilibrium level at 19 km, reaching up to 27 km. Afterwards, the plume sank back again now due to its weight and began spreading laterally into the umbrella cloud. As the plume swung down and above its equilibrium level (where buoyancy is zero), it created the so-called gravity waves visible in the picture. They are comparable to those waves induced when a stone is thrown into a lake and produces ring-shaped surface waves. Our correspondents Aris and Andy sent us some impressions from the devastated areas near Kelut. The village Pandan Sari (Ngantang) is totally destroyed. Up to 1 meter of tephra (ash, lapilli and small bombs) have fallen in places and 30 cm of ash is found inside houses. Our correspondent Andi wrote: "Jogja and many cities in the west and east of Java is covered by raining ash and layered until 3-4 mm. It's terrible that the ash could reach Jogja and other cities until 500 km away from Kelud as well as covered Borobudur temple again as in eruption 2010. ... The color (of the ash, rmk) is white powder and some black particles inside as well that maybe there is some pyroxene (small black particles)." BNPB (civiele bescherming) bevestigd 3 doden (direct of indirect) veroorzaakt door de uitbarsting: twee ten gevolge van ademhalingsproblemen veroorzaakt door de as, als een auto-ongeluk tijdens de evacuatie. Alle slachtoffers waren in Pandasari dorp van minder dan 7 km van de vulkaan waar 20 cm voor ash is gedaald. Tot nu toe bevestigd 76,388 mensen geëvacueerd in 293 schuilplaatsen tot nu toe, terwijl de evacuatie inspanningen binnen de 10 km uitsluiting zone blijven. Voorlopige schattingen zijn dat de uitbarsting 80 miljoen kubieke meter tefra geproduceerd. Op dit moment blijft de vulkaan uitstoten as en stoom, vergezeld van tremoren. De regering van Oost-Java heeft verklaard dat de noodtoestand voor het getroffen gebied. 350.000 stof maskers worden verdeeld.